محمدی, علی, علی اکبری بیدختی, عباسعلی, احمدنژاد, محمد. (1395). بررسی ناپایداری در لایه سطحی دریا و تاثیر آن بر ارتفاع امواج. مجله ژئوفیزیک ایران, 10(3), 11-24. علی محمدی; عباسعلی علی اکبری بیدختی; محمد احمدنژاد. "بررسی ناپایداری در لایه سطحی دریا و تاثیر آن بر ارتفاع امواج". 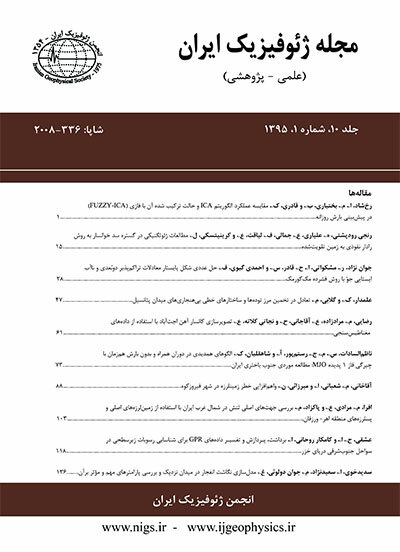 مجله ژئوفیزیک ایران, 10, 3, 1395, 11-24. محمدی, علی, علی اکبری بیدختی, عباسعلی, احمدنژاد, محمد. (1395). 'بررسی ناپایداری در لایه سطحی دریا و تاثیر آن بر ارتفاع امواج', مجله ژئوفیزیک ایران, 10(3), pp. 11-24. محمدی, علی, علی اکبری بیدختی, عباسعلی, احمدنژاد, محمد. بررسی ناپایداری در لایه سطحی دریا و تاثیر آن بر ارتفاع امواج. مجله ژئوفیزیک ایران, 1395; 10(3): 11-24. با استفاده از روش‌های نیمه‌تجربی می‌توان ارتفاع موج در سطح دریا را با دقت مناسب محاسبه کرد. در این روش‌ها اثرات دمای سطح و ناپایداری در لایه سطحی با تقریب ضعیفی بر محاسبه ارتفاع موج موثر است. با توجه به متغیر بودن اثرات دمایی سطح آب و دمای هوای نزدیک سطح دریا در طول روز، اثر ناپایداری بر ارتفاع موج در طول روز و ماه تغییرات زیادی دارد. در این مقاله با به‌کارگیری روشی نیمه‌تجربی، اثرات ناپایداری بر روی لایه سطحی محاسبه شده است. روش نیمه‌تجربی معرفی شده از برازش ارتفاع موج در ماه‌های مختلف سال نسبت به دو متغیر مستقل سرعت اصطکاکی و تابع پایداری سرعت حاصل شده است. رابطه نیمه‌تجربی به‌دست آمده در هر نقطه‌ای در دریا با نقاط مجاورش متفاوت است و لازم است با مطالعه داده‌های بویه موج نگار در بازه زمانی طولانی تابع پیش‌بینی ارتفاع موج در نقطه مورد نظر با دقت قابل قبولی به‌دست آید. در این مقاله به‌علت کمبود داده‌ها فقط از داده‌های سال 2008 بویه موج‌نگار امیرآباد دریای خزر استفاده شده است و با توجه به عدم دسترسی به داده‌ها در بازه زمانی حداقل ده‌ساله تنها روش نیمه‌تجربی معرفی و میزان دقت آن مورد مطالعه قرار گرفته است. نشان داده می‌شود که، با در نظر گرفتن اثر ناپایداری در لایه سطحی بر ارتفاع موج، براساس رابطه پیش‏بینی ارتفاع موج، می‌توان خطای آن را تا 10 درصد کاهش داد. In this study, using similarity laws and regression methods, numerical modeling of wave height estimations has been carried out for the data recorded by a station in the southern part of the Caspian Sea during the year 2008. Numerical simulations require powerful computers and their results may be accurate and reliable if proper physics is used. However, semi-empirical models can easily calculate wave heights but in practice are less accurate. In the latter methods, the surface temperature and instability effects have little impact on the effective wave height calculation. The nature of these methods is such that usually the effects of the instability of the surface layer are not considered in the calculation of wave heights. In experimental methods, the effects of variations of frictional velocity and the stability parameter are important factors which are considered as coefficients and directly applied in the equations. In this paper, the correlations between the wave height measurements and the friction velocity and the stability function are considered. These correlations are evaluated for exponential, logarithmic, polynomial and inverse polynomial functions. In order to calculate the friction velocity and the stability functions, a bulk aerodynamic model similar to the one used in Fairall et al. (2003) is used. It includes an iterative algorithm with an initial guess for the friction velocity and Monin–Obukhov length. The accuracies of the friction velocity and Monin–Obukhov length are then increased by iteration. a) In the semi-empirical models, the effect of stability function can be directly entered into the equation and the uncertainty in the coefficient can be reduced. b) The stability function in the atmospheric surface layer has an important role in the air–sea interaction; hence its consideration can increase the accuracy of the wave height prediction. a) In the cold months (October–December) in the port of Amir Abad, the conditions are more unstable, while in relatively warm months (July and August) there are more stable conditions. b) The correlation coefficient between the friction velocity and the wave amplitude in the cold months is less than that for the warm months. c) The correlation between the stability fiction and the wave height in the cold months is smaller than that in the warm months. d) Regression error rates for the friction velocity in the cold months are higher than those for the warm months of the year. Wave height calculation error in December (with a maximum error of linear regression with friction velocity) decreased down to ten percent by calculating the nonlinear regression with a mixture of the third-degree polynomial, inverse polynomial and logarithmic functions for the stability. This reduction in the wave height calculation error is simply due to the effect of stability function. The friction velocity seems to have little impact on the results of the regression method. Although the results are only for the data of the year 2008 recorded in the Amir Abad Port, but the results are not limited to a specific time and place and show the impact of stability function on wave height estimations. The main achievement of this paper is a reduction of error in wave height estimation that is achieved by taking into account the stability function. However, much higher reduction in the wave hight errors cannot be expected, because a large part of the waves characteristics are caused by wind effects at different times and places. Since the effect of the surrounding area of Amir Abad Port has not been considered in the present work, only a reduction of the calculated wave height error was possible. چگینی، و.، گلشنی، ع.، تائبی، س.، و چگینی، ف.، 1391، امواج ناشی از باد و پیش­بینی آنها در خلیج فارس، دریای عمان و دریای خزر: موسسه ملی اقیانوس­شناسی، 479 ص. چگینی، ف.، چگینی، و.، و تائبی، س.،1387، ارزیابی و مقایسه روش­های نیمه­تجربی و عددی در پیش­بینی مشخصات امواج بنادر امیرآباد و بوشهر: نشریه مهندسی دریا، 7، 41–57. Arya, P.S., 2001, Introduction to Micrometeorology (Vol. 79). Academic Press. Brutsaert, W. H., 1982, Evaporation into the Atmosphere — Theory, History, and Applications: Reidel, 299 pp. Busch, N. E., 1973, On the mechanism of the atmospheric turbulence: Workshop on Micrometeorology, Amer. Meteo. Soc., 1–66. CEM., 2002, Coastal Engineering Manual: US Army Corps of Engineers. Charnock, H., 1955, Wind stress on a water surface: Quart. J. Roy. Meteor. Soc., 81, 639–640. Cohen, J., Cohen P., West, S. G., and Aiken, L. S., 2002, Applied Multiple Regression/Correlation Analysis for the Behavioral Sciences, 3rd ed., Psychology Press. Dyer, A. J., 1974, A review of flux-profile-relationships: Boundary-Layer Meteorol, 7, 363–372. Fairall, C. W., Bradley, E. F., Rogers, D. P., Edson, J. B., and Young, G. S., 1996, Bulk parameterization of air–sea fluxes for Tropical Ocean-Global Atmosphere Coupled-Ocean Atmosphere Response Experiment: J. Geophys. Res., 101 (C2), 3747–3764. Fairall, C. W., Bradley, E. F., Hare J. E,. Grachev, A. A., and Edson, J. B., 2003, Bulk parameterization of air–sea fluxes: Updates and verification for the COARE algorithm: J. Climate, 16, 571–591. Floors, R., Batchvarova, E., Gryning, S.-E., Hahmann, A. N., Peña, A., and Mikkelsen, T., 2011, Atmospheric boundary layer wind profile at a flat coastal site – wind speed lidar measurements and mesoscale modeling results: Adv. Sci. Res., 6, 155–159. Foken, T., 1990, Turbulenter Energieaustausch zwischen Atmosphäre und Unterlage – Methoden, Ebtechnische Realisierung sowie ihre Grenzen und Anwendungsmöglichkeiten: Ber Dt Wetterdienstes, 180, 287 pp. Foken, T., 2008, Micrometeorology, Springer, 306 pp. Garratt, J. R., 1992, The Atmospheric Boundary Layer: Cambridge University Press, 316 pp. Holton, J. R., 2004, An Introduction to Dynamic Meteorology: 4th ed., Academic Press. Huang, C. H., 2012, Modification of the Charnock wind stress formula to include the effects of free convection and swell. In Advanced Methods for Practical Applications in Fluid Mechanics, Ed. Jones, S. A., INTECH Open Access Publisher. Large, W. G., and Pond, S., 1982, Sensible and latent heat flux measurements over the ocean: J. Physical Oceanography, 12, 464–482. Liu, T. W., Katsaros, K. B., and Businger, J. A., 1979, Bulk parameterization of air–sea exchanges of heat and water vapor including the molecular constraints at the interface: J. Atmos. Sci., 36, 1722–1735. Markowski, P., and Richardson, Y., 2010, Mesoscale Meteorology in Midlatitudes, John Wiley & Sons. Miller, M. J., Beljaars, A. C. M., and Palmer, T. N., 1992, The sensitivity of the ECMWF model to the parameterization of evaporation from the tropical oceans: J. Climate, 5, 418–434. Monin, A. S., Obukhov, A. M., 1954, Osnovnye zakonomernosti turbulentnogo peremesivanija v prizemnom sloe atmosfery (Basic laws of turbulent mixing in the atmosphere near the ground): Trudy Geofiz Inst AN USSR, 24(151), 163–187. Oost, W. A., Komen, G. J., Jacobs, C. M. J., and van Oort, C., 2002, New evidence for a relation between wind stress and wave age from measurements during ASGAMAGE: Boundary-Layer Meteor., 103, 409–438. Panofsky, H., 1973, Tower micrometeorology: In: Haugen D. A., (ed) Workshop on Micrometeorology, American Meteorological Society, pp 151–176. Powell, M. D., Vickery, P. J. and Reinhold, T. A., 2003, Reduced drag coefficient for high wind speeds in tropical cyclones, Nature, 422, 279–283. Roll, H. U., 1948, Wassernahes Windprofil und Wellen auf dem Wattenmeer: Ann. Meteorol., 1, 139–151. Smith, S. D., 1988, Coefficients for sea surface wind stress, heat flux, and wind profiles as a function of wind speed and temperature: J. Geophys. Res., 93, 15467–15472. Stull R. B., 1988, An Introduction to Boundary Layer Meteorology: Kluwer, Dordrecht. Taylor, P. K., and Yelland, M. A., 2001, The dependence of sea surface roughness on the height and steepness of the waves: J. Phys. Oceanogr., 31, 572–590. Vickers, D., and Mahrt, L., 2006, Evaluation of the air-sea bulk formula and sea-surface temperature variability from observations: J. Geophys. Res., 111, 1–14. Webster, P. J., Lukas, R., 1992, TOGA COARE: The Coupled Ocean–Atmosphere Response Experiment: Bull. Amer. Meteor. Soc., 73, 1377–1416. White, G., 1996. WCRP workshop on air–sea flux fields for forcing ocean models and validating GCMs: WMO/TD-No. 762, World Meteorological Organization, 184 pp. Young, I. R., 1998, An experimental investigation of the role of atmospheric stability in wind wave growth: Coastal Eng., 34, 23–33. Zeng, X., Zhao, M., and Dickinson, R. E., 1998, Intercomparison of bulk aerodynamic agorithms for the computation of sea surface fluxes using TOGA COARE and TAO data: J. Climate, 11, 2628–2644. Zeng, X., Dickinson, R. E., 1998, Effect of surface sublayer on surface skin temperature and fluxes: J. Climate, 11, 537–550. Zilitinkevich, S. S., 1969, On the computation of the basic parameters of the interaction between the atmosphere and the ocean: Tellus, 21, 17–24. Zilitinkevich, S. S., Perov, V. L., and King, J. C., 2002, Near-surface turbulent fluxes in stable stratification: Calculation techniques for use in general circulation models: Quart. J. Roy. Meteorol. Soc., 128, 1571–1587.